Albyon was a game promising to be what Ultima was and a whole lot more. 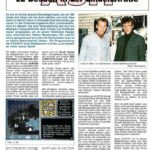 In an issue of ASM 12/88 (As highlighted to GTW by Zeldin), there was an article about the game’s creators (The authors of “Die Fugger“), viewing a demo of their new game. The game, again in Ultima style, was to use 8 disk sides, 800 graphic icons (Ultima had 512), 10,000 sprites, proportional fonts, animated windows, 3D battle scenes, interactive characters and an own developed RPG-Interpreter…. Phew!, a lot, and the demo’s proved this ambition was real at a party of “Der Computer-Club e.V.”, whom the owner at that time was Knuth Reuter. More information is needed on the exact distance the game made before it was scrapped. The game could even have been finished, though on the scale of the project, this may have been unlikely. Hopefully a trace of the game’s creators will lead onto more on this game, and maybe some previews which were shown at the party mentioned above.